Effects of soybean rust (fungus Phakospora) on soybean leaves. 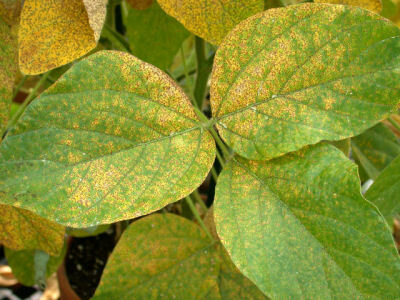 In the picture above, some sections of the soybean leaves have been infected by the fungus Phakospora (soybean rust) and have changed colour from green to yellow, because chlorophyll has been destroyed. The fungus attacks the cells by penetrating the walls and using their contents and nutrients to feed itself and develop. Question: Compare the leaves affected by Phakospora (above) and Cercospora (below). What are the differences between the symptoms of the infection? Cercospora fungus on a leaf. Different fungi show different symptoms on the plant leaves. 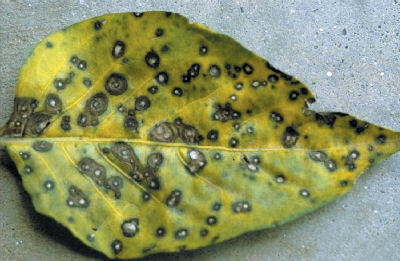 In the picture above, the fungus Cercospora has infected parts of the leaf and the infection has begun spreading outwards. As the infection spreads, the cells initially lose their chlorophyll and then dry out and die (brown patches). In some cases the appearance of circular areas of dead cells, is actually a defence mechanism of the plant. Since the fungus is spreading from cell to cell, the plant can deliberately cause the death of the cells surrounding the point of infection. Without living cells to spread to, the fungus dies and the spread of the disease is stopped. 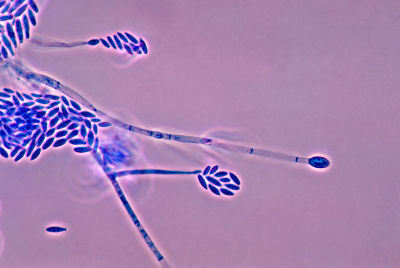 Structure and spores of the fungus Fusarium verticilliodes. In the image above we can see the structural elements of the fungus Fusarium verticilliodes and its spore sacks. 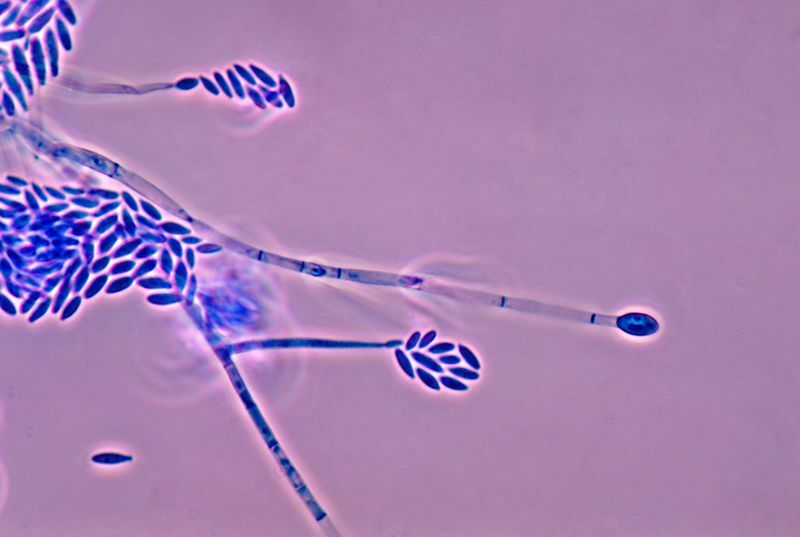 The spores are released in optimum conditions of temperature and humidity and when they reach a leaf's surface, they produce a probe that penetrates the cell wall. Using that probe the fungus uses the cells nutrients to feed itself, creating those structures and spore sacks, repeating the circle. The spectral response of those leaves will have higher red reflectance - because of reduced chlorophyll concentration - and lower near-infrared reflectance, due to the loss of water and the breakdown of cellular walls.